The Red Moon Bakery is a Canadian Bakery in South Delhi. It opened it's doors in December 2007. It is owned and operated by David and Anna Hambly from Canada. 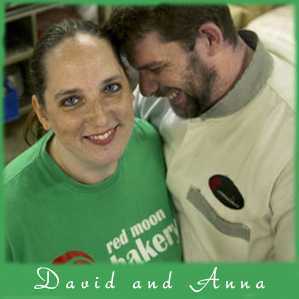 You can find David and Anna mostly every day baking up a storm in our Okhla Kitchen. We are foodies at heart and are happy to be making New Delhi our second home! We have a fun loving and loyal staff that are here to serve you, so give us a call sometime soon!